Finance Minister of India today has announced Indian Economy's next year forecast today, Economic Survey 2015-16 in parliament. Just ahead of Union Budget, as every year, Finance minister forecast the upcoming economic session for country. Here is some highlights you need to read about how indian economy will perform or expected to perform in next financial year. As per last budget and other international banking organization, rating agency and world bank, Indian economy is expected to grow at 8% for next few years. Below is some of the highlights putted by Finance Minister of India on Economic Survey 2015-16. 1. GDP Growth :- The finance ministry is expecting that India's GDP will grow in range of 7 to 7.5% in next Financial year. 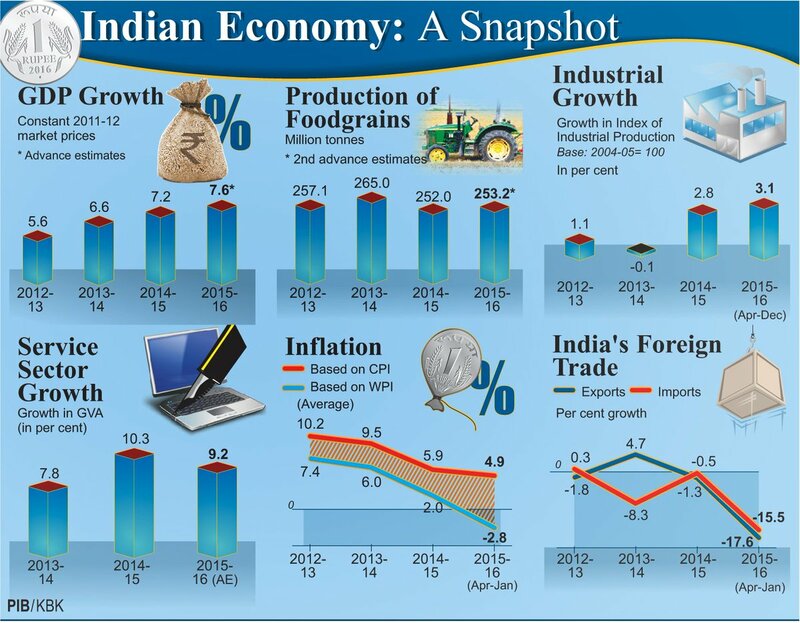 From 5.6% in 2012-13 and 7.2 in 2014-15 economy is expected to grow at 7.6% of rate in 2015-16. 2. Fiscal Deficit :- In 2015-16 the fiscal deficit is expected to touch 3.9% of GDP which is actually achievable while fiscal deficit was 4.9% of GDP in 2012-13. 3. Foreign Exchange Reserves :- India's Foreign Exchange Reserves is touched to $349.6 Billion in 2015-16 from $341.6 Bn in 2014-15. 4. Service Sector's Growth :- India is highly reliable on service sector and agriculture. Service Sector's Growth is 9.2% in 2015-16 while it was 10.3% last year. 5. 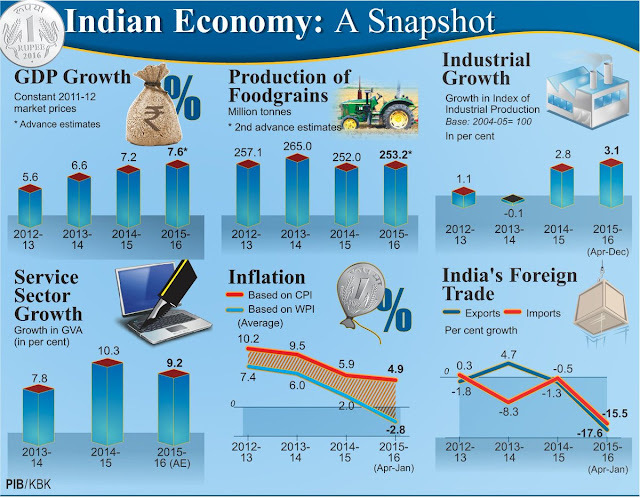 Industrial Growth :- India's industry is growing at 3.1% in 2015-16 which is bit more compared to 2.8% in 2014-15. 6. India produce highest milk in the world. With share of 18.5%, India Ranks first in mil production. 7. Per Capita Income :- India's Per capita income is growing at 6.2% in 2015-16 compared to 5.8% in 2014-15. Per capita income is Rs.93,231/- per year. 8. Unemployment Rate :- India's unemployment rate is at 4.1% in rural and 2.7% in Urban. 9. Import Export :- India's Import-Export market is quite decreasing. Imports are declined to -15.5% and export declined to -17.6% compared to -1.3% and -0.5% last year. Despite heavy success of Make in India, india still not matching the export figures. 10. Production of Food Grains :- India producing (expected) 253.2 million tonnes of Food grains in 2015-16 year which is almost same as last year. These are just Economic Survey figures, the real Union Budget 2016-17 is about to release on 29th February, 2016. Keep visiting India Shine for more updates.